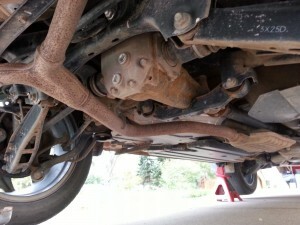 Subarus are straightforward to jack up, but if you have never done it before or you just don’t want to screw something up on your car then this post is for you. Using the provided jack points and few jack stands it is possible to rotate your tires and do an oil change on the forester in a few short minutes at home. If possible you should rotate your tires every oil change. I usually do mine while the oil drains out of the car. 2015 Subaru Forester Normally Aspirated. 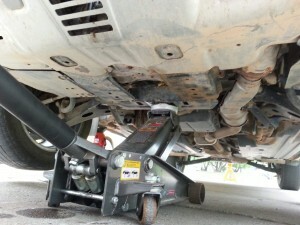 Subaru Forester Rear Jack point. (Just below the two bolts in the center of the picture) The rear differential will flex when you jack on it. If you have an after market hitch you get to cheat. If you have a fat cow of a floor jack like I do you will want to jack up the front of your car first. If you jack up the rear first the front end of the car will be so low to the ground that you are unable to get the jack point behind the oil pan. 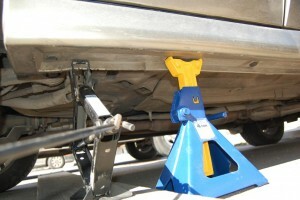 Keep you jack stands set as low as possible to achieve your job. They are a lot more stable and stronger the lower they are. It should go without saying, but always use jack stands… NEVER GO UNDER YOUR CAR WHEN IT IS ON THE JACK ONLY… See the dent in the back of my skid plate? Setting up jack stands and the jack rolled… I got really lucky it hit there and not the oil pan. Which brings me to my next point. Do not use spacers on your jack. *One hockey puck is OK* Tall blocks of wood = bad idea. Always Use at least 3 Jack stands(4 if not on a center point). NEVER let your car balance on the two center points it will fall off! If you have an after market curt hitch it is plenty strong to jack on unless you have a load of brick in he back of your car. 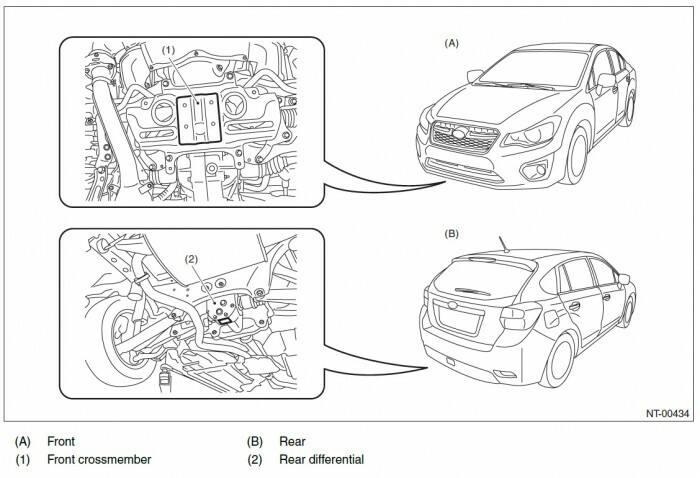 Where to Jack on an Impreza or Cross Trek. DO NOT win a Darwin Award! NO! If you do this there is a very good shot you will die under your beloved Subaru. Jack Stands only go this way. Never put them on plastic! Always on a flat surface. If you see a jack stand that is not flat on the floor jack the car back up and reset the jack stand. Holly crap that rear underside of the Forester is rusted! Mostly red clay or crushed “clinker.” They use it as gravel around here. Yep… in general it is easier to jack up the front first. IF you jack up the back first most jacks will not be able to slide far enough back to get to the center jack point. 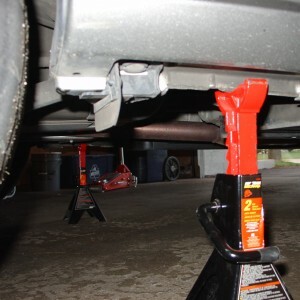 Depending on the style of jack-stand I usually use the emergency jack points for the jack stands – (Makes it easy to level the car). If the V on the jack stands is too deep you might have to put the front jack stands near the connection points on the sub-frame. It’s not a bad idea to toss a hockey puck on the jack for a contact point – (as long as you are using a cup style floor jack). 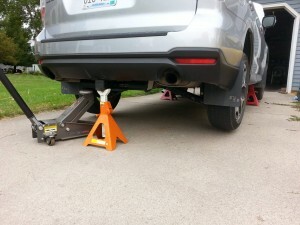 What’s the minimum lift I need to use a hydraulic jack on my 2015 Forester in order to change wheels (using jack stands, of course)? 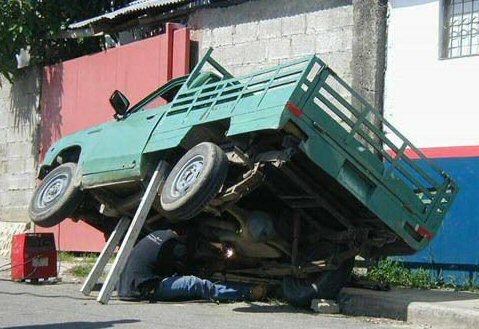 My medium size harbor freight floor jack could do it. I think I may have needed a small wood spacer to get the front high enough to get the jack stands under. I would say shoot for 19″ or better for max lift height. Where are the jack stand placement points on the sides? 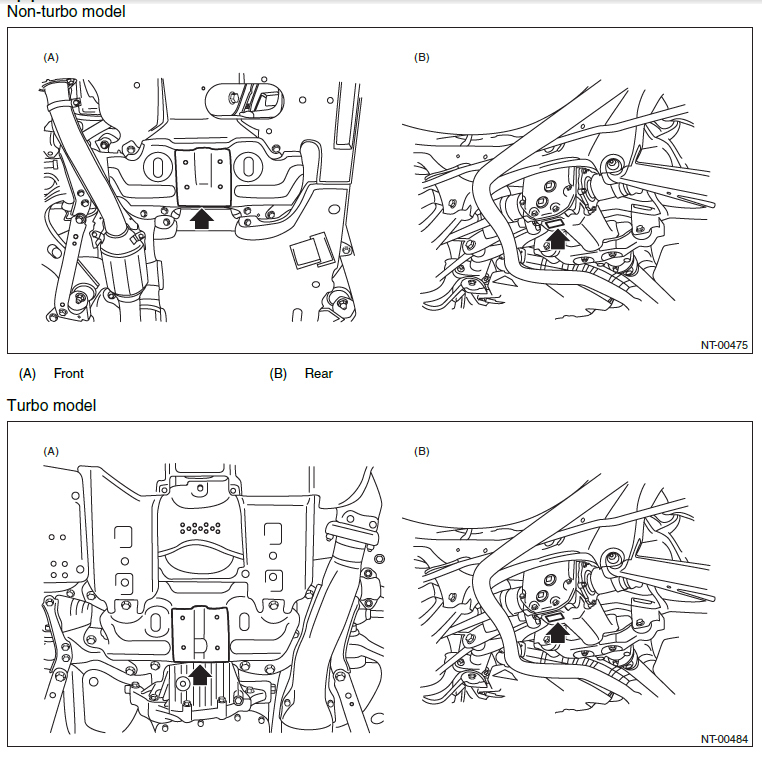 You didn’t show that in the diagrams. Thanks! While not shown in the diagrams I do show them in photos (near the bottom of the post). 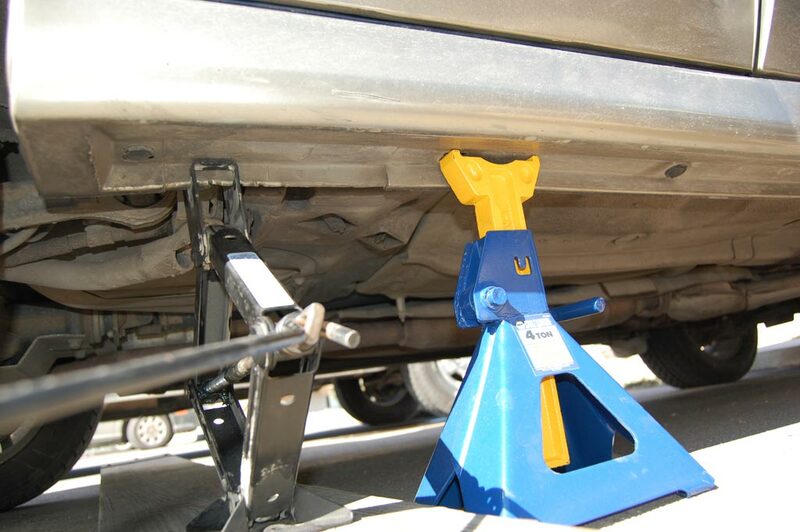 Jack stands should generally be placed at the emergency jack points under the car. There is a notched spot just behind the front wheels and in front of the rear wheels. If you don’t know what I’m talking about the emergency jack points are generally noted in the regular owners manual in the car. There are also some safe points on the subframe, but it is best to avoid those unless you have a specific reason to use them.